A significant drawback of standard lathes is the lack of capability to produce long, slender parts, especially if they contain complex geometries. Standard lathes operate over the entire length of the part, resulting in large deflections at the center. These shortcomings can cause uncertainty in the dimensions of manufactured parts, limiting the length-to-diameter ratio of a product. We utilize precision Swiss-style CNC machining, developed for the Swiss watch industry where tolerances and pieces are incredibly small and slender, which allows us to deliver incredibly precise parts. Standard lathes were incapable of such tasks, and so the Swiss-style lathe was created. These lathes operate by pushing the work piece through a guide bushing, which is in the same location as the main spindle on a standard lathe. This capability allows for these lathes to have both axial and rotational movement of the work piece. By keeping the tooling close to the guide bushing, the deflections are kept at a minimum regardless of the part length. The Swiss style machining process allows for our customers to receive long, slender, and complex manufactured parts that are impossible to create using a standard lathe. With a maximum part length of 12 ft. and a maximum diameter 1.5 in., our Swiss-style lathes can produce exceptionally large parts with incredible precision and accuracy. Coupled with over twenty material options for manufacturing, our customers have the freedom to design their product knowing Millennium Precision has the manufacturing capability to meet their requirements. We take pride in our ISO 9001:2015 certification, which shows our devotion to quality control and thorough documentation throughout our manufacturing process. Every part or lot is cataloged, recorded, and tracked throughout the facility. We understand that our customers have expectations in the delivery of high-quality components, so our Swiss-style contract manufacturing service ensures well-accepted quality procedures and documentation standards are in place throughout the manufacturing and supply chain process to ensure the delivery of quality components and that no part is lost even after leaving our doors. Our Swiss-style CNC machine shop, located in Manchester NH, can help lower costs and time on your next project. 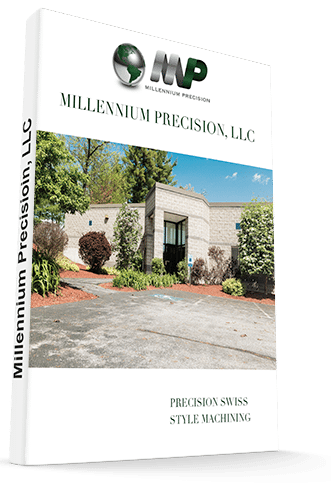 With simultaneous precision Swiss machining, that includes control of multiple axes, and with advanced precision Swiss CNC equipment, Millennium Precision can eliminate the need for additional secondary operations. These improvements translate to significantly lower processing time and manufacturing costs for our customers. Feel free to contact us to see how we can help on your next manufacturing project.